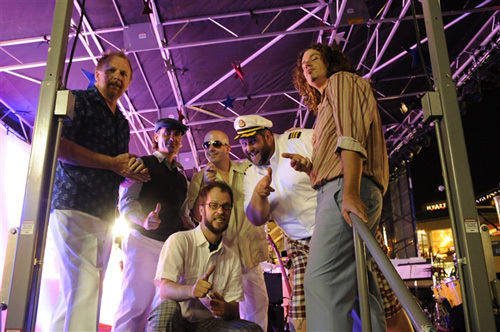 6 cool dudes in loose moods bringing you the finest yacht rock from the land of pleasant living. The smooth rock sounds of the late 70’s thru the mid 80’s. Whether it be the cheesy goodness of Hall & Oates or the complex cool of Steely Dan, it’s all yacht rock baby and it’s all good.Yacht Rock- the smooth and cool sounds of 70’s and 80’s soft rock. Great for dancing, singing along or just listening. All the great songs and guilty pleasures you grew up listening to. Feel the waves of nostalgia wash over you as hit song after hit song takes you back to the days of listening to the am radio while riding around in your parent’s station wagon. Prepare yourselves for the looks of amazement that you and your friends will share as THE REGAL BEAGLES deliver one song after another that you have never heard any other band play live. Although the sounds of Yacht Rock are light and breezy, they are deceptively difficult to recreate. THE REGAL BEAGLES are 6 of the Mid-Atlantic region’s finest players and singers and it still took over a year of rehearsal to get this band ready for the stage. You won’t believe how effectively this band recreates every nuance of the AM Gold era. And it’s not just the sounds of the era that the guys bring to the party. You’ll also get a good chuckle out of their snazzy costumes and lighthearted, funny show. So, if you’re looking for something fun and fresh, Yacht Rock is what you need and THE REGAL BEAGLES is the band to bring it to you. ARE YOU READY FOR SOME SOFT ROCK?! ?